Hatters boss Nathan Jones hailed his side as a 'touch of class' after they defeated MK Dons 3-0 in the Checkatrade Trophy this evening. With an injury-hit squad, then Jones had to play Glen Rea and Jorge Grant from Saturday's 3-0 victory over Scunthorpe, while also starting James Justin, who got 45 minutes at the weekend too. 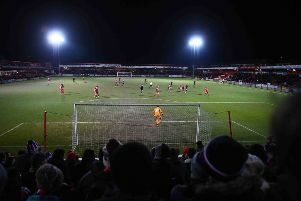 Goals from Alan Sheehan, Kazenga LuaLua and Grant were enough to send Town through, as they could have had more but for some missed chances and fine saves from ex-loanee Stuart Moore, with the Luton chief saying: "I'm delighted, apart from a nine minute period after half time, I thought we were totally dominant, in everything we did. "I thought we were excellent, we got the first goal, and then Kaz who was just magnificent all night got the second and then second half we should have won by five or six. "I'm not being disrespectful, we’ve had clear-cut chances where they’ve tried to come out and we’ve hit them on the counter, as has happened in pretty much every home game we’ve played. "So I’m very, very pleased as we’ve been stretched in terms of our squad. JJ and (Andrew) Shinnie and Granty and Glen have had to double up. "We’ve had so many injuries we had to do it, but I thought we were magnificent tonight and that's why I love my football club as they’re right at it to be fair. "They showed that they were class tonight, a touch of class. “MK are doing really well, they probably had a little bit more experience than we did, but I thought we were absolutely excellent and the irony is, what a great game the keeper had.